I was amazed when my doctor told me I was going to have triplets. There aren’t any porters, so we’ll have to find a trolley for the luggage. Young children seem to master computer games with ease. We completed the climb with relative ease (=fairly easily). She won the 400 metre race with ease. 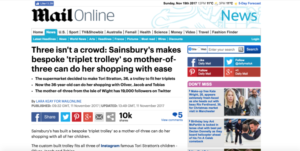 Sainsbury’s has built a bespoke ‘triplet trolley’ so a mother-of-three can do her shopping with all of her children. The custom built trolley fits all three of Instagram famous Tori Stratton’s children – Oliver, Jacob and Tobias. Mrs Stratton, 36, and her youngsters are well-known on the picture-sharing app with 19,000 followers on her ‘triplet mummy’ account. He left the house at nine exactly, as is his custom. On Wednesday evening, as was his custom, he went down to the village. 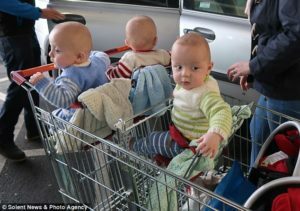 The supermarket giant decided to design the trolley after she told them how much she struggled to do her weekly shop with the standard two seats. The mother-of-three, of Cowes, Isle of Wight, said: ‘It’s really nice to have the trolley there – now we have the option of actually being able to go. ‘I didn’t really do a lot of shopping on my own because it was impossible with the triplets, but now it’s possible for me to do a shop by myself. 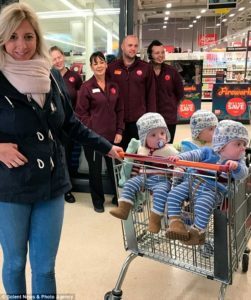 A Sainsbury’s spokesman said: ‘We’re delighted Tori is happy with the trolley we designed for her and her triplets. ‘We want to be the most inclusive retailer and we‘re always looking at new ways to make our customers feel welcome when they shop with us. 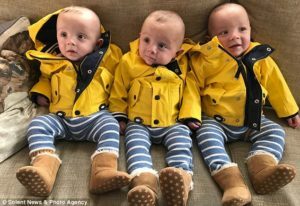 The triplets were born at 30 weeks and spent six weeks in the island’s neonatal intensive care unit before paramedics Mrs Stratton and her husband Andy could take them home. I‘m absolutely delighted that you can come. Our aim is to create a fairer, more inclusive society.